Because IRRRLs are a refinance program, their spikes in volume at times when rates saw significant drops makes a lot of sense. The end of 2014 and beginning of 2015 both saw major volume spikes, and happened to be at two points in which rates were at their lowest points in the period. 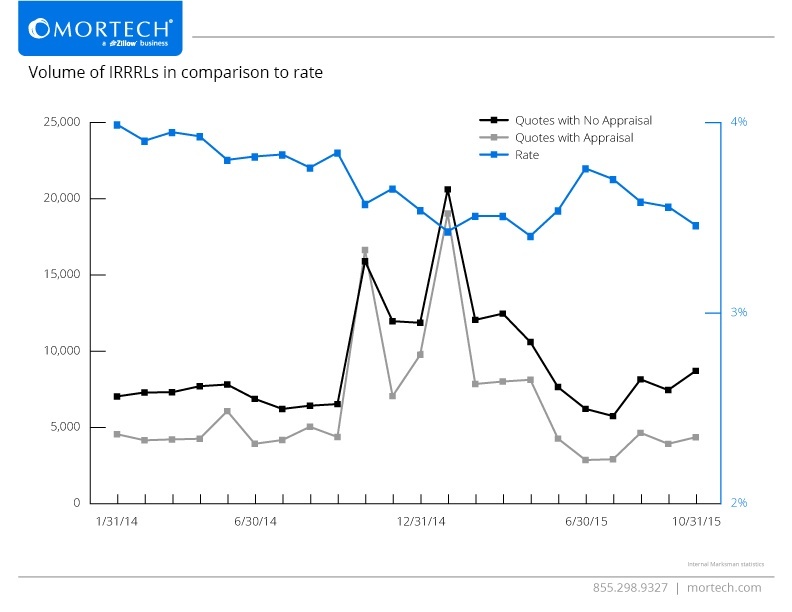 Similarly, as rates hit their high points, IRRRL volume dropped dramatically. This is particularly evident towards the middle of 2015, when rates rose dramatically after a two-month period and, as a result, IRRRL volume dropped to its lowest volume of the observed period. What's evident from the data set as whole is, like with most other loan products, IRRRLs and their volume are heavily rate dependent, and see the most activity when rates are at their lowest, and decline in volume as rates go up. This has been the case with several other products, whose data we've also examined and found similar activity. This then points to the continual importance of not only having accurate rates to begin with, but being able to push those rates to as many people as possible, who will be using those rates to determine whether or not they're ready to borrow. Fortunately, Mortech not only pushes your rates to thousands of potential borrowers every day, but does so quickly and accurately. By putting your rates online automatically, loan officers using Marksman can instead focus on other aspects of their job, like connecting with prospects and building better customer relationships, all while knowing that their rates are online, correct, and being seen at any time of the day. For more information on how you can gain access to Marksman and its features, you can schedule a free consultative demo with us today and find out what you can gain with Marksman.